Eliminating the foods that trigger baby eczema symptoms often leads to significant improvement in eczema because symptoms of eczema from food allergies occur much more frequently in early life than later in life. A baby’s eczema can go from severe to mild just by removing the triggering foods. The foods that trigger baby eczema symptoms may be in the diet of the breastfeeding mother or in the diet of the baby if he or she is formula-fed or consuming solid foods. 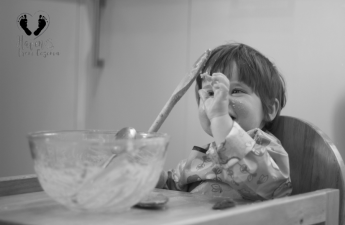 Meal planning is one of the areas of focus in creating a daily routine to treat baby eczema. In this article, I discuss the common food allergies, food intolerances and sensitivities to be aware of for both mom (if breastfeeding) and baby. I also provide helpful tips on the best healthy alternatives. 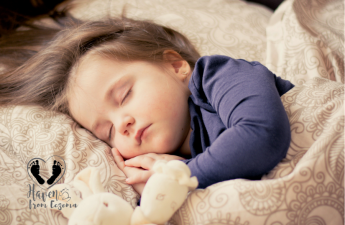 Check Out: How to Create a Daily Skin Care Routine to Treat Baby Eczema to go over all the other areas of focus in more detail. The best way to know if foods are triggering your baby’s eczema is by first eliminating each of the most common eczema food triggers listed below (milk, eggs, fish, shellfish, etc) for one month to see how the skin reacts. Then add each food back into your diet (if breastfeeding) and/or your baby’s diet one at a time. Carefully watch for reactions. Reactions can occur up to four days later so its really important to keep a diary. If the eczema has not improved, I would recommend eliminating the other following food types I have discussed below. It is possible that your baby may not be allergic to any specific food, but can still be sensitive to certain foods. As a personal example, my son initially tested negative for most food allergies, yet when I did an elimination diet and eliminated certain foods from my diet (breastfeeding) his skin improved by 95%! 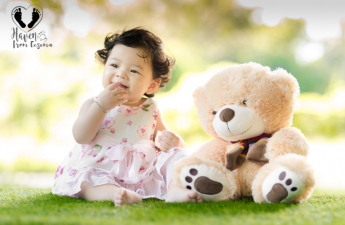 Once you have identified which foods and/or baby formula that causes allergic reactions and/or triggers eczema, its crucial to replace them with nutritious alternatives, so you and your baby don’t miss out on essentials vitamins and minerals. This is very important! For breastfeeding mothers, for example, diary can be easily replaced with rice milk or oat milk or almond milk if there is no tree nut allergy. Eggs can be replaced with legumes such as beans and lentils. 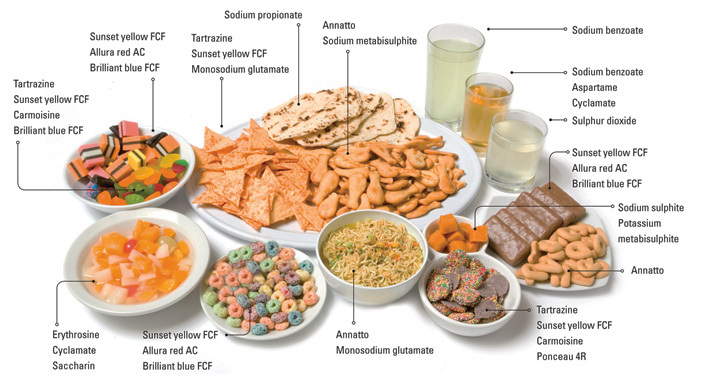 See the diagram below for more alternative food substitutes from each of the allergen food category. 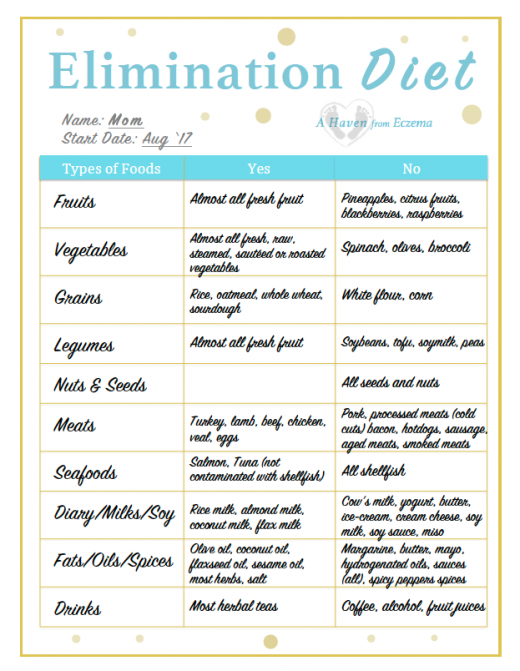 Here’s an example of my Elimination Diet Sheet that I follow. Also, be sure to read the product labels and any possible cross-contamination with other allergens. Important: An elimination diet is always best to do while under a health practitioner’s supervision, especially when babies are involved. Allergy reactions occur either fairly quickly after a feed, such as vomiting/reflux, sneezing, hives, swelling of lips/tongue, difficulty breathing, trouble swallowing, or happen within hours or days later, such as blood in the bowel movements or eczema. While any food can cause an allergic reaction, the foods listed below are the most common foods that trigger eczema and allergies. 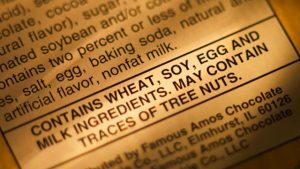 The foods most frequently identified as allergens were eggs, milk and peanuts. 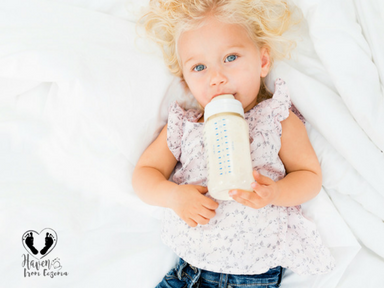 For babies formula-fed or supplementing with breastmilk that are having a reaction to both soy and milk-based formulas, a protein hydrolysate formula can be an alternative option. These formulas are hypoallergenic because the proteins are so small that they can’t induce an allergic response. 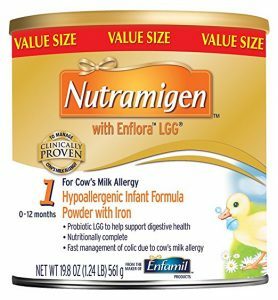 Nutramigen and Alimentum are brands usually prescribed to infants who are having digestion issues or severe allergic reactions. 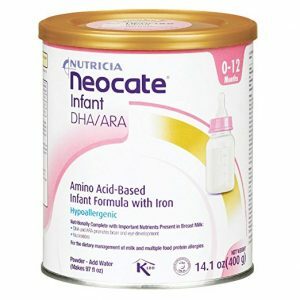 For infants with severe digestive tract issues that are incapable of digesting intact protein, a few brands such as Neocate, PurAmino and EleCare are amino acid-based baby formulas. These formulas are made only with individual amino acids, the most hypoallergenic and simplest form of protein that is less likely to trigger an allergic response. Regardless if food allergies are present, it is ideal to choose a baby formula with partially hydrolyzed protein for newborns because of the health benefits. Infants fed hydrolysate baby formula develop less atopic diseases like eczema. And before choosing a hypoallergenic infant formula, consult your baby’s pediatrician first. It is highly recommended by pediatric allergists to start baby on only foods with low allergenicity and limited in variety. There is no particular order for the introduction of any specific food but it is recommended to start baby solids at the sixth month. Also, baby should avoid the main allergy posing foods until he or she is 12 months old. If you find your baby reacts to foods in your diet, you may need to be extra careful when introducing solids. Reactions after eating foods directly can be more serious than when the baby was reacting through breast milk. If you think your baby is having allergic reactions, it is vital to consult your doctor before introducing the more risky foods listed above. 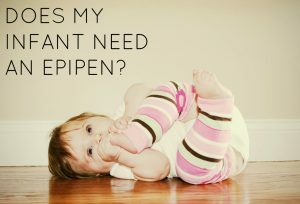 Many pediatricians and allergists will recommend providing EpiPens® or Auvi-Q when there is a risk for anaphylaxis (serious, life-threatening allergic reaction that include wheezing, swelling of lips and tongue and difficulty breathing). For mild allergy symptoms that include itching, sneezing, hives and rashes, an antihistamine like Benadryl is used. It very important to know the difference between a severe, life-threatening allergic reactions and mild allergy symptoms. Nonetheless, be sure to gradually introduce solids, one at a time, over the course of three to five days to observe for signs of an allergy or an intolerance. If baby has previously demonstrated any type of allergic reaction, a certain protocol should be followed: the sequential incremental dose method for introducing solid foods. Most pediatricians recommend starting rice baby cereal at about 4-6 months old for baby’s first food. Unfortunately, research has found that the rice (white and brown) in the baby cereals are high in the toxin arsenic. High levels of arsenic damages the nervous system as well as cause poor concentration and memory, and reduced intelligence. Also, most baby rice cereals include allergens such as milk, eggs, soy or wheat in their ingredients which can trigger eczema symptoms. I recommend to wait until baby is 6-8 months old that’s when babies begin to produce salivary amylase. And they don’t develop pancreatic amylase, the powerhouse of carbohydrate digestion, until 8 months on average. Oatmeal cereal may be a better starter cereal than rice. 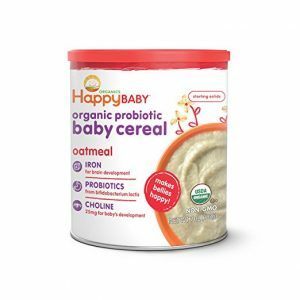 Beech Nut Oatmeal Cereals and HappyBaby Probiotic Cereal (our favorite brand) don’t contain any milk or soy, however they do contain wheat. 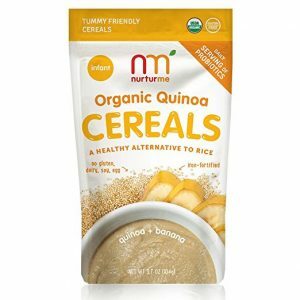 Another great option that is gluten-free is NurturMe Organic Quinoa Cereals, they are quinoa based cereals with 100% plant-based nutrients with added probiotics. Most importantly NurturMe cereals are made without gluten, dairy, soy and egg. Check Out: Healthy Altnernative Baby Foods on the Go for Busy Families on more baby food products we love that are tummy friendly and eczema safe. Reactions caused by food intolerance do not involve the immune system like an allergy does and might be quite delayed, such as appearing 24–48 hours or more after your baby was exposed to the food. It may be too early tell if your lil one has a salicylate, amine or natural glutamate sensitivity/intolerance, but it is important to note that foods high in these natural chemicals can cause symptoms wide ranging, from itchy skin, worsening of present eczema rashes and red patches on ears and face to sleeping disorders, behavioral changes, and gastro-intestinal symptoms. Foods very high in these natural chemicals are avocados, spinach, tomatoes, grapes and broccoli. I recommend consuming foods low-to-medium in these chemicals are pears, cabbage, apples and bananas. Another complex process that doctors and researchers are only just beginning to understand the various is histamine intolerance or histamine excess. Although indispensable in the efficient functioning of many body systems, histamine can make some existing eczema conditions worse if there is an excess or an intolerance. Eczema is an inflammatory condition in the skin, so when high histamine foods are consumed, people with less than efficient histamine tolerance may experience an increase in the severity of their eczema. Histamine has been consistently detected in fruits such as citrus fruits, berries such as strawberry and raspberry, tomatoes, kiwis, apricots, cherries and plums, and some vegetables, particularly aubergine, and pumpkin. Symptoms of histamine and natural chemical toxicity are the same as an allergic reaction: a runny nose or nasal obstruction can be the first signs. Other symptoms include skin rash, a worsening of eczema symptoms, headaches, diarrhea, stomach ache, colic, sneezing, asthma and facial flushing. It is become more and more known that the acidity in our diet can not only cause, but worsen eczema. The foods we consume is what creates an acidic or alkaline body. The average American diet is very high in acid forming foods. These include meat, grains, dairy, sugar and processed foods. Not to mention, these are also food groups that are highly subject to hormone treatments, antibiotics and genetic modification as well as synthetic chemicals. The measure of the acidity or alkalinity of our body’s fluids and tissues is the pH (the potential of hydrogen) and its range is from 1-14 with a neutral balance level at 7. So anything below 7 is considered acidic and the lower the number the more acidic. The optimum of peak performance that the body operates is at a pH level of 7.4 which means the body needs to be slightly alkaline which is a diet at around 70-80% alkaline and no more than 20-30% acidic. To measure your pH level, the easiest and accurate way is to use pH urine strips. You can test your pH levels often throughout the day, but try to do so at the same time each morning. 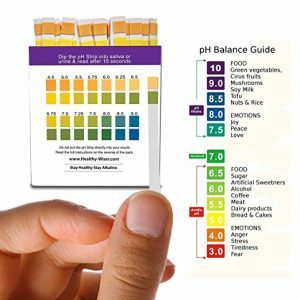 Research has shown that when the body becomes more acidic, the body’s organs have to work much harder to balance its internal pH level which it does so naturally. When your pH levels are more acidic, the body begins to use up the minerals the body has stored. The organs, such as the kidneys, have to work harder to rid itself of this acidity. To reduce the body’s acidity the body begins to deplete itself of vital minerals such as potassium, magnesium and calcium. Other organs such as the lungs and the skin also become utilized by your body to expel the acid build-up. This means that acidic toxins which are normally expelled by the kidneys build up on the surface and within the skin. This build-up of this acidity is one of the primary reasons why an individual will break out with eczema. 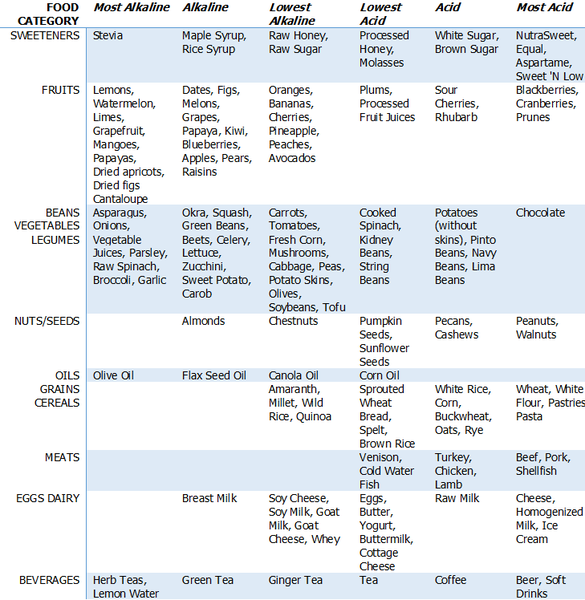 Here is a guide chart of foods listed most alkaline to most acidic. Its important to remember that with eczema, nothing is ever easy, especially when it involves food and diet. If you determine certain foods do trigger your baby’s eczema but his or her skin is still inflamed, it’s likely food isn’t the only trigger. But, identifying and eliminating the foods that cause the skin to flare from your diet (if breastfeeding) and your baby’s diet, will certainly provide you and your baby with relief. Since all eczema is not the same and what works for one may not work for another, keeping a journal is key. Some foods trigger eczema outbreaks and knowing what the triggers are, may get you closer to the root cause. And if you’re on an elimination diet and breastfeeding, just remember everything becomes easier with time. Take it one day at a time and focus on the present moment. It takes a lot of courage and willpower but know you will be stronger in the end. 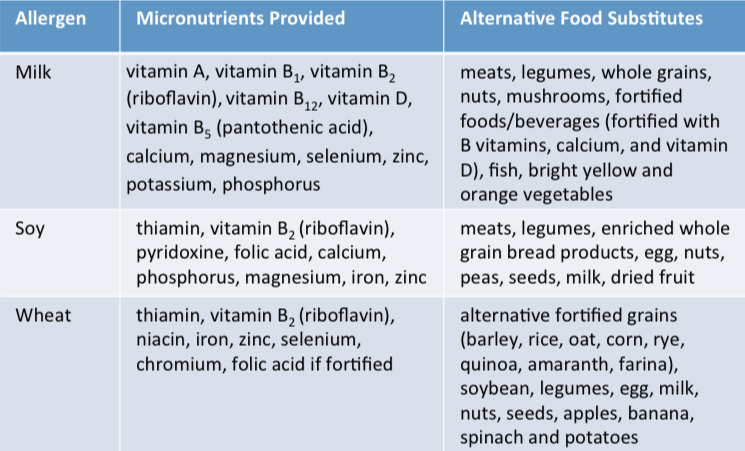 Important: Dietary elimination of major foods will impair the growth and develop nutritional deficiencies of infants and children. Most food allergic/sensitive babies and children are at an increased risk of nutritional deficiencies especially when they have allergies to commonly used allergens such as milk, soy, eggs, and wheat. Providing safe food can be challenging and a balancing act. Nutrition monitoring and focusing on “key” nutrients to decrease risk of nutrition related problems is critical.